The space you provide customers and employees represents your company. We want to help you design an appealing outdoor space, that is as put-together as your business. We are here to make you look good, so you don't have to worry about it. Our design experts at Scottsdale Landscaping are just what you need to create the perfect work environment for your commercial business. We will lend our trained-eye for landscape design and help you work out the details on what your business needs, and our team will install it all to your liking. 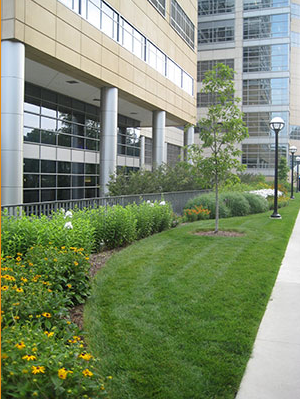 A new landscape design has plenty of benefits--you can switch to low-maintenance plants so you have one less part of your business to worry about, the addition of flowers and other plants will improve the look of your business and attract customers, and the installation of lighting, benches, or a small garden can improve your employee safety and job-satisfaction. The possibilities are endless. ​Our number one mission with our commercial customers is lightening the load of already busy business owners. We understand how important it is to keep up your business' presentation--and we can make that one less thing for you to worry about! We offer multiple design services and new installations and additions to improve your landscape. You will not regret a choice to work with the experts at Scottsdale Landscaping, contact us today to begin redesigning your business' landscape! Decorative feature installations, including rocks, sidewalks and stepping stones, bricks and edging, lighting, walls, fountains, and much more. ​​This is only an overview of all the landscape design services we provide. Call Scottsdale Landscaping to discuss your design goals and schedule an appointment.